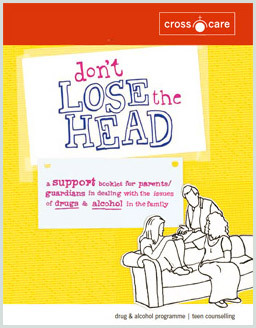 Don't Lose the Head is an easy-to-read booklet for parents, whether or not they have teenagers who use drugs. Colourful and catchy, it provides parents with the distilled wisdom of two services involved in drug prevention. Teen Counselling and the Drug and Alcohol Programme [DAP] are two of Crosscare’s services to young people and families. Teen Counselling offers a free counselling service to teenagers and their families, regardless of whether drug-use is involved. DAP provide support to anyone concerned about drugs (including alcohol). DAP work within diocesan structures to deliver workshops/ training courses on Don’t Lose the Head. If you are involved in a parent group, parish group, community group or other and you would like DAP to deliver a workshop please contact Susan at 01 836 0911 or email susan@crosscare.ie. This booklet and workshop are available free of charge.